We operate from a world class data centre staffed 24/7/365. The Data Center facility infrastructure starts with several diverse OC48 SONET fiber rings, providing the basic connectivity to eight different Internet access carriers. 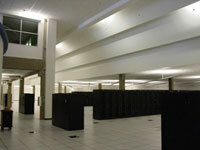 The 35,000 square foot datacenter is state of the art. The bare essentials are: A preaction dry-pipe sprinkler system with 580 smoke detectors and a VESDA contaminate system to create a full proof fire prevention system. POWER FAILURE PROTECTION: 2 backup generators capable of storing 4000 gallons of diesel fuel. The Data Centre can operate for 15 days on generator power without a refuel. HIGH SECURITY: The entrance to the datacenter is comprised of badge-keyed doors that are monitored by our internal tracking system as well as closed-circuit cameras, ensuring that no unauthorized entities may enter the premises. At Exreal we take your web hosting operations very seriously and that's why we believe your site should be in the best infrastructure possible.